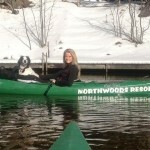 Welcome to Northwoods Canoe & Kayak Rentals located on the beautiful Au Train River! Our canoe and kayak livery has been family owned and operated since 1968, making us the original canoe livery on the Au Train River! We also offer premium Old Town vessels, ensuring a comfortable trip! Our goal is to make it easy for you to enjoy a day of paddling on the slow-moving, scenic Au Train River with your friends and family! We are the only livery service to offer a private launch at both bridges and a private parking lot! Beat the crowds, make it easy, and paddle with us! Perfect experience for Churches, Schools, Groups & more! We’re open spring thru fall for paddling fun! 9am-9pm; 7 Days a Week! 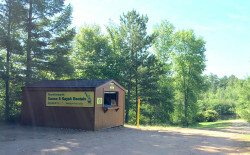 Stop by our rental outpost to start your trip! 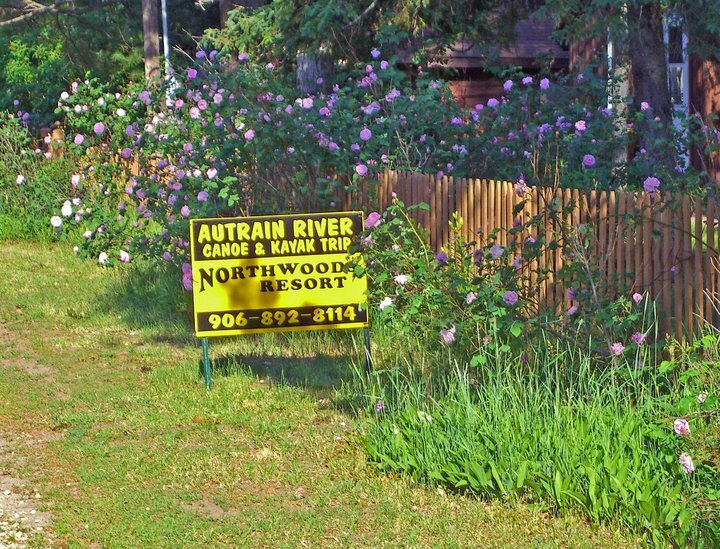 Your Au Train River canoe & kayak trips will begin at our private launch site at the Riverside Bridge and end down-stream at our private landing next to the Doucette Bridge. While the bridges are only 1 mile apart by road, the lazy river meanders 7.5 miles though the Hiawatha National Forest. Expect a leisurely paddle down the river, as the current is just strong enough to pull you along! For most paddlers this trip takes about 3 hours to complete. The river is about 2-3 feet deep and is mostly sand bottom. Deer, ducks, fish, and blue heron are just some of the animals that can be seen on this adventure! Leave the logistics to us as we will have your canoe, kayak or paddleboard setup for you upon arrival. Simply park in our private parking lot at the end (Doucette Bridge) and we will shuttle you to the launch site (Riverside Bridge)! When your trip is complete, simply pull up your canoe and your car will be waiting for you after a fun day on the Au Train River! 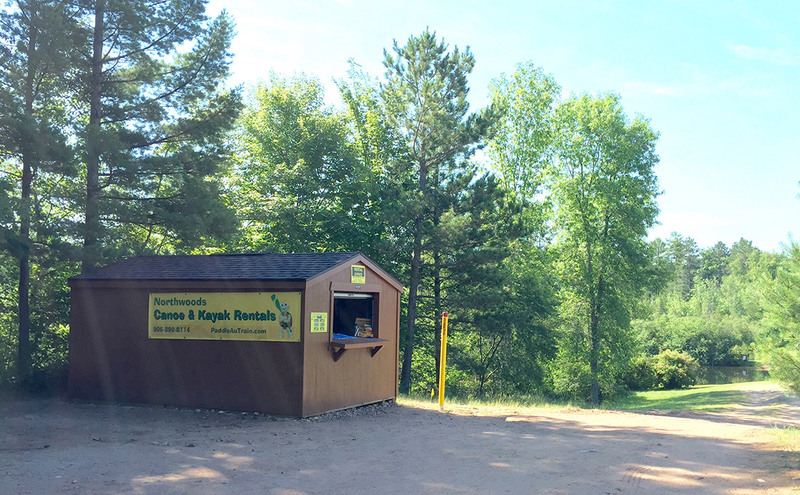 The Northwoods Canoe and Kayak Rental is the only livery to offer a private launch, private landing area, and a private parking lot. Don’t get caught in the crowds or park along the road (risking a ticket)! 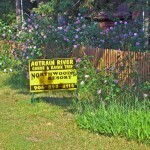 Simplify and book your Au Train River Trip today!! The Au Train River is a gentle river as it wanders through the Hiawatha National Forest. 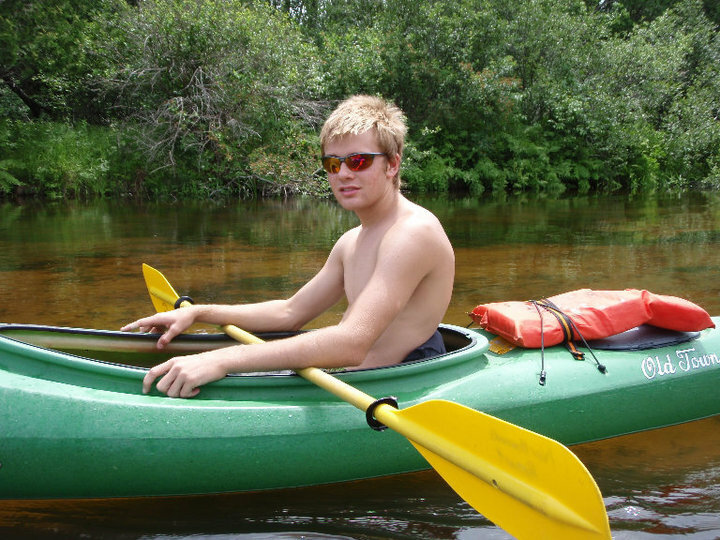 You will paddle by a few cottages along the river and then enter the wilderness of the Hiawatha National Forest. Keep your eyes open for wildlife as they come down to the water to drink or watch for birds flying overhead. The river passes through a couple sloughs where you might see great blue herons or ducks swimming in the water. Be sure to take a snack or a picnic lunch and don’t forget your camera. If you are going to fish, you will need a Michigan fishing license. 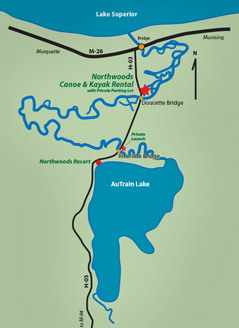 The Au Train River is the home to Walleye, Trout, Perch, and a variety of other fish. Anglers might like to fish the Steelhead runs in the spring or the Salmon runs in the fall. 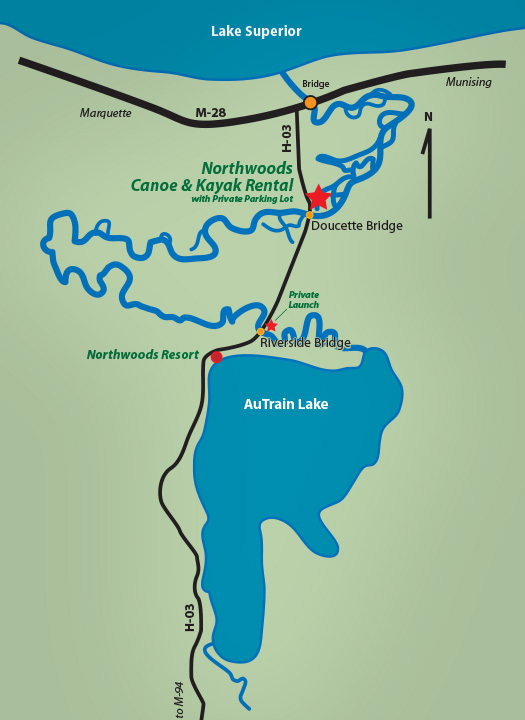 Enjoy a beautiful summer day in the Northwoods with a paddle down the Au Train River or a boat ride on Au Train Lake. 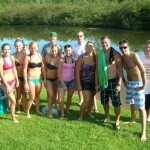 If you would like to volunteer in our annual Northwoods Au Train River Cleanup Day please contact us! Look for more information as September approaches! Terms and Conditions of Payment and Cancellation: A credit card is required to hold your reservation for capacity purposes. Your credit card will not be charged until the day and time of your scheduled canoe/kayak trip. Cancellation due to weather: No cancellation fee charged (must call to cancel) We paddle rain or shine. Option to reschedule. If you have any questions or concerns, please feel free to contact us. We'd love to hear from you! 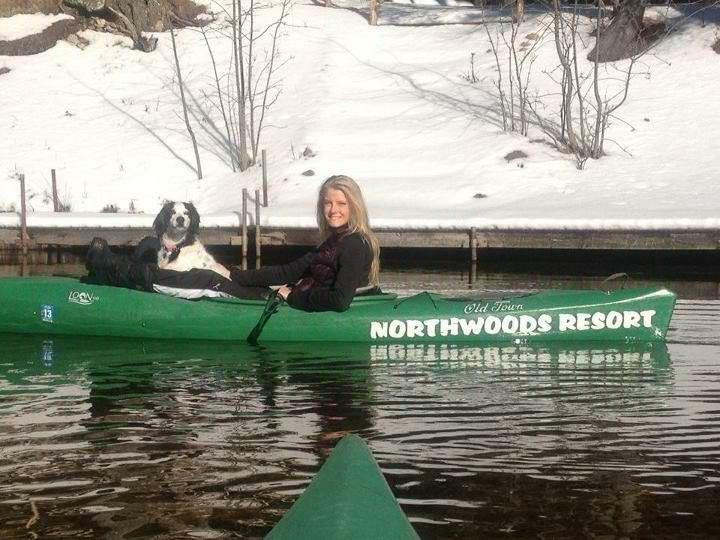 Northwoods Resort is just 2 miles from the beaches of Lake Superior, the world's largest freshwater lake. Be sure to take a trip to Pictured Rocks National Lakeshore to appreciate the beauty and clarity of this lake's waters. 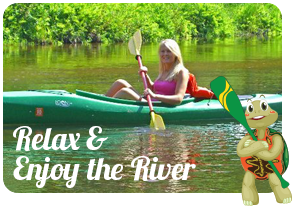 ©2015-2018 Northwoods Canoe & Kayak Rentals All rights reserved.